Are you planning to get into longboarding and searching for an affordable one? Then Quest Native Spirit Kick Tail Longboard Skateboard, 40-Inch can be the ideal one you’re searching for! This 40? 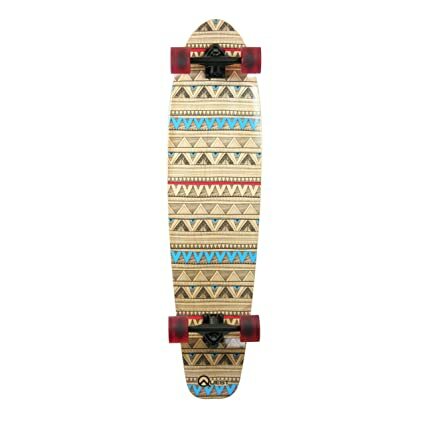 longboard features a seven-ply hardwood maple deck with its Aztec inspired design, making it an awesome looking board. At this price range, this longboard definitely packs a punch regarding what comes with it. Rugged & lightweight trucks: This longboard showcases six-inch aluminum trucks, which have a reverse kingpin configuration. The six-inch trucks not only offer you the smooth ride, but also give you a responsive control of the longboard. Sturdy deck construction: The seven-ply hardwood maple deck of this board flexes very little, is sturdy & long lasting. The 40 inches of huge lightweight deck will make you stay attached & provide you all the crazy turns & cruising that you desire to. Kicktail: The kicktail in the board is a plus even if you imagine you will not be requiring one now. 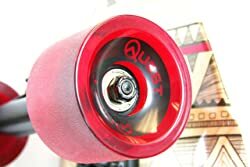 The inclusion of the fantastic kicktail in the Quest Native Spirit Kick Tail Longboard Skateboardmakes it very easy to do quick tricks, turns, and pop up & down curbs. Excellent Cruising: With this the Quest Native Spirit Kick Tail longboard, you’ll love to cruise & learn new turnings in an awesome way. The elegant design & shape of the large deck makes you feel stable &provide you the ease you seek. It is reliable & smooth as it has ABEC 7 rating bearings which are fairly high precision & good quality bearings. Durable PU wheels: 70 millimeters diameter PU wheels that come with this longboard are very durable.Polyurethane wheels are common among longboard and skateboard wheels simply because they offer a good “grip” to the surface. Normally, the diameter of board wheels hasdiameters in the array of 65mm to 75mm. The greater diameter wheel translates into a greater speed but lower acceleration. This board’s 70mm polyurethane wheels are flawlessly in the middle of this spectrum of speed & acceleration that is perfect for beginners. Overall, this longboard is a fantastic beginner board for someone planning to get into longboarding. Particularly, this is a great board for somebody who’ll be focusing on utilizing the board for cruising & as means of transport. At this price point, it will be a fantastic gift for just any occasion!